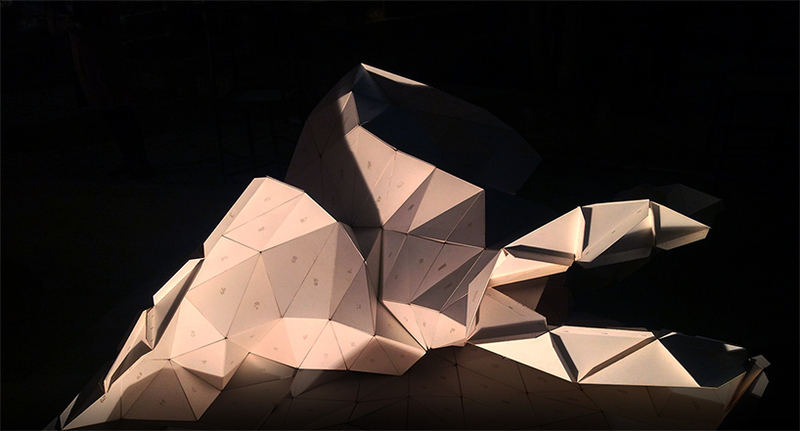 Triangulated Skin - Installation by WEsearch lab at M.S. University, Baroda - ArchitectureLive! 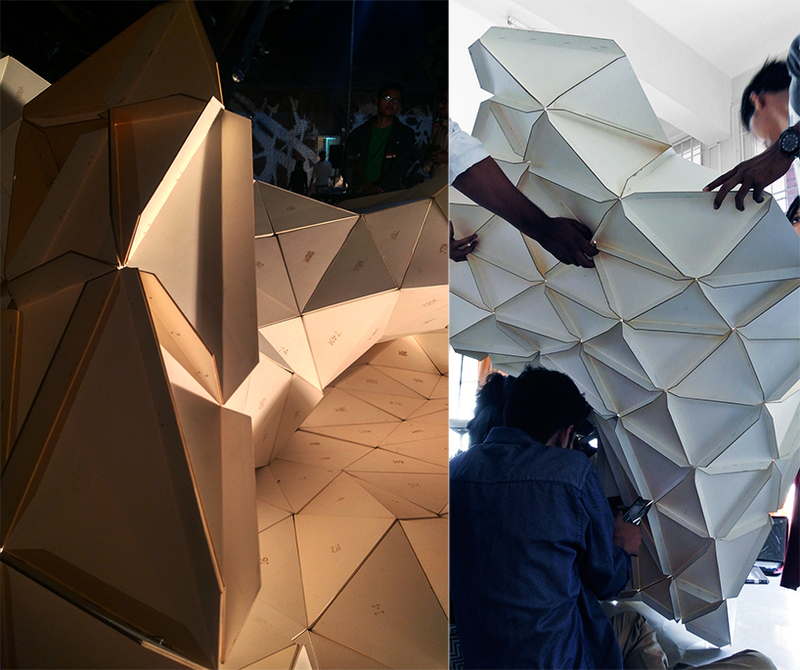 WEsearch lab recently completed their ‘Triangulated Skin’ installation at Department of Architecture, M.S. University, Baroda as part of a design computation workshop. 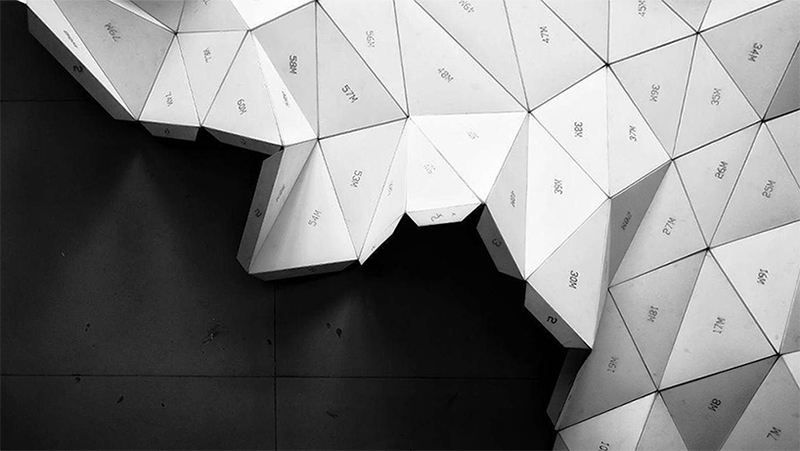 The installation is literally a triangulated skin made of 2mm thick mount boards which are laser cut into shape, and joined using 10mm wide staples. The method of assembly selected was low-tech to adhere to the strict duration and budget constraints, and to make the process participatory. The installation is on display at the architectural event – Reflection 2017. 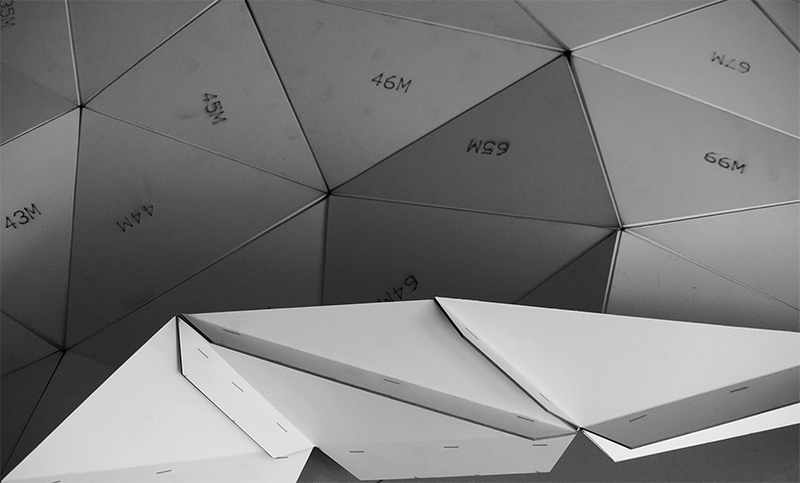 The installation is made of 400 pieces of triangles with flaps, which comprises of four sets of 100 different pieces (as shown in the diagram above). The half-cut flaps are folded and stapled to each other using simple low-tech flap to flap alignment. Because the flaps are stapled and the folds are free to rotate, the triangles can uni-axially rotate at every flap joint. 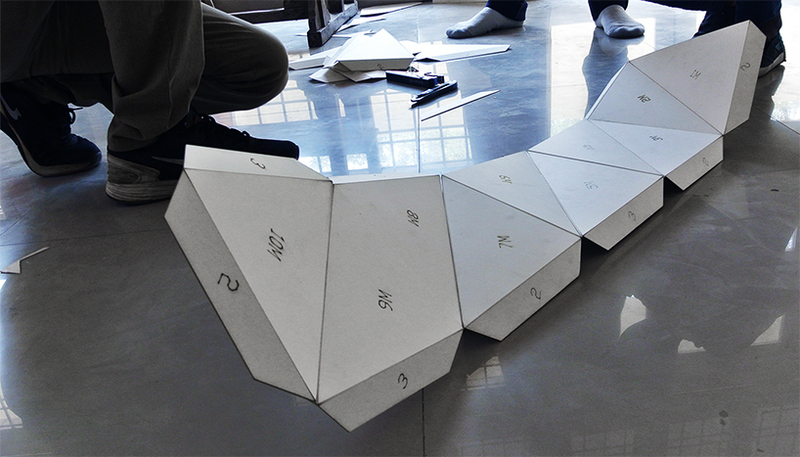 The triangles and flaps are numbered, which allowed easy one to one assembly of the triangles. 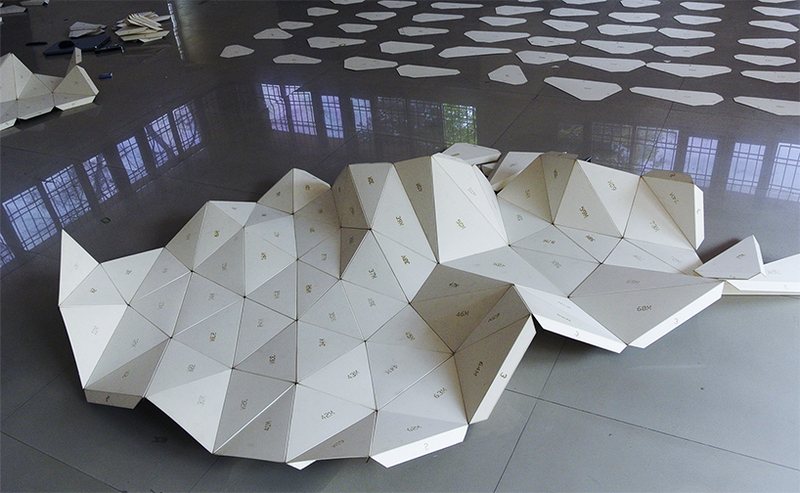 As a consequence of the pin joinery of the triangles, the installation can be arranged in infinite number of ways, making the triangular skin amorphous in nature. 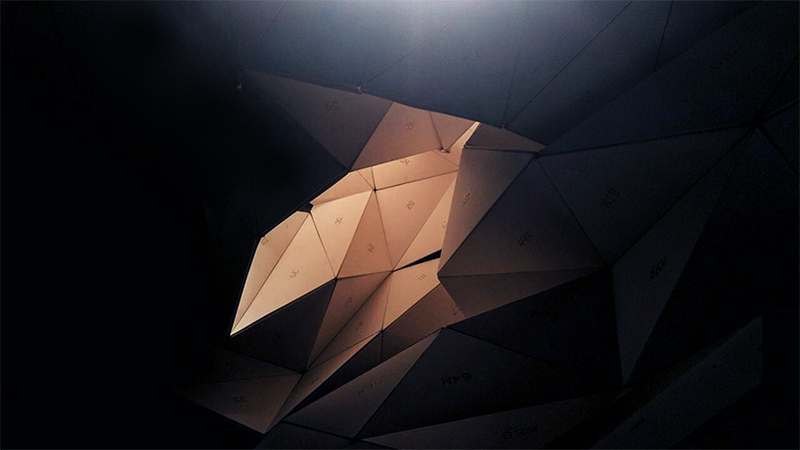 The installation is literally a triangulated skin made of 2mm thick mount boards which are laser cut into shape, and joined using 10mm wide staples. The method of assembly selected was low-tech to adhere to the strict duration and budget constraints, and to make the process participatory.